Hilton Garden Inn, Kohlmeyer Hagen, Law Office Chtd. 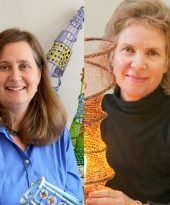 Gail Katz-James, metal sculptor and Jenny Hale, light artist, explore the intersection of solid and patterned forms. Their collaboration is a metaphor of the interplay of the materials they love. Without open spaces in the solid steel, there would be no shadows. Gail Katz-James is a Minneapolis artist who transforms steel, wire and recycled objects into sculptures. She received an Artist Initiative Grant from the Minnesota State Arts Board for 2016-2017. She previously exhibited Mod Pod (2017/18) and Treasure Tower (2016/17) in the CityArt Tour. Gail recently completed Flour Sack Rack, an outdoor, permanent commission for the City of Minneapolis. Jenny Hale is a public artist based in Northern California. Her multi-media artworks are site-specific, related to environmental themes, and often involve diverse, local, multi-generational populations in the design and execution phases. She is currently using the medium of light, shadow, and projected images to explore the intersection of nature and technology and the life force that drives it all. This is their second collaboration. More about Gail. More about Jenny.